dump style powerglide transmission. We have gone to great lengths to remove 6 1/2 lbs. of rotating weight. This transmission is designed to make you more competitive. ~ Circle glide valve body. ~ PG billet input shaft. ~ Wide steel high gear hub. ~ Kevlar lined low gear band. ~ Special pump modifications for superior lubrication. ~ Special machined high gear drum with 6 clutches in place of stock 4. ~ Extensive internal machining to remove 6 1/2 lbs. of unnecessary rotating weight. ~ 1/2" I. D. fittings in case and pump. ~ Optional rear pump for push start. THE ULTIMATE CIRCLE GLIDE TRANSMISSION! remove 6 1/2 lbs.of rotating weight. ~ A lever style dump action that is easy to hook up to existing clutch pedal or lever. ~ Internal dump valve body. TORQUE CONVERTER CIRCLE TRACK POWERGLIDE! This transmission is built for the circle track racer that needs to run a torque converter. fluid or moving parts. 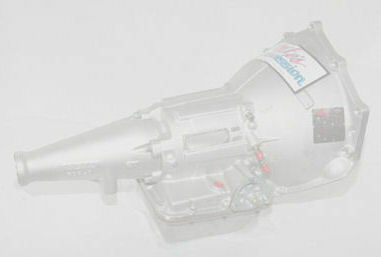 It is a direct drive unit that appears to have a torque converter. dump action powerglide that appears stock. ~ Lightweight torque converter shell.